I have a lovely medlar tree in my front yard that yields fruit every year in the Winter. Medlar is a very sweet fruit that I think it tastes like dates and apples. It was very popular in the middle ages. Charlemagne was said to have decreed that a tree be planted in every town he conquered. Every year with the fruit from my bountiful medlar tree, I make medlar juice, mespilomel (medlar melomel), syrup, jam, jelly and paste. With the paste I reserve a small portion for my very special Medlar soap. This year I have recreated this special soap for my Etsy Customers. This soap has a fruity and almond scent. 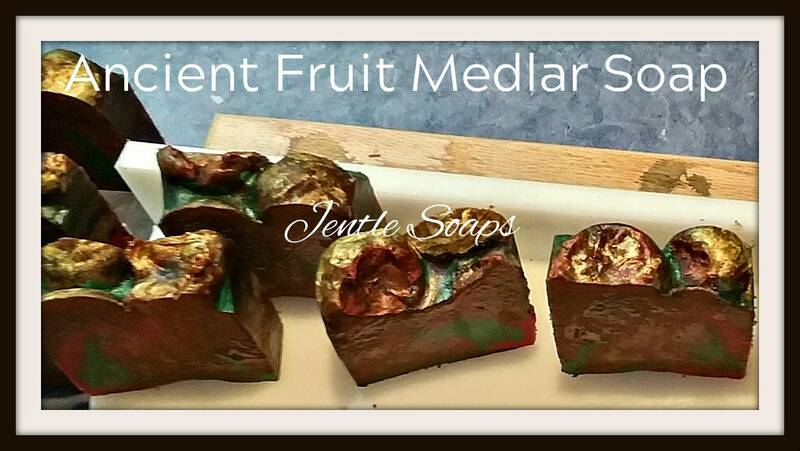 I incorporate medlar paste into my soap using the cold and hot process method. I have a specialty made mold that was made with my crop in 2018. It is gilded with mica in gold, crimson, green and iridescent. There are deep red and green swirls. There was so much soap in this first batch that the vitamin rich fruit was oozing as I cut the loaf. This moisturizing 3 oz bar is excellent as a facial soap.